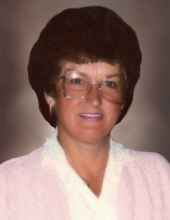 On Saturday, February 2, 2019, Kay J. Popps went home to be with her Heavenly Father after a brief illness at age 79. Kay was a loving mother of three children, Rick (Patti) Coleman of Port Charlotte, FL, Lisa Coleman of Midland and Suzanne (Tim) Brewer of St. Charles. Kay had twelve grandchildren and several great grandchildren; all were her pride and joy. Kay was an avid Red Wings hockey fan, and loved to crochet and bake. Kay was born to George and Doris Popps on October 20, 1939 in Mio. She spent her younger years growing up in Mio, later moving to Midland where she met and married Bernard Coleman. She later moved to Phoenix, AZ where she passed away peacefully at Hospice of the Valley. Per Kay’s wishes, no services will be held at this time. A memorial service will be held at a later date. Kay’s final resting place will be in the Kittle Cemetery in Mio. Anyone wishing to make a charitable contribution may consider the American Stroke Association in honor of Kay Popps. To plant a tree in memory of Kay J. Popps, please visit our Tribute Store. "Email Address" would like to share the life celebration of Kay J. Popps. Click on the "link" to go to share a favorite memory or leave a condolence message for the family.